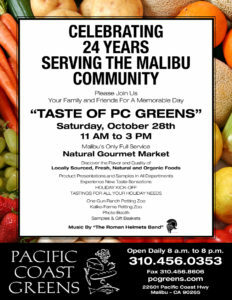 Come join us Saturday, October 28th to get a “Taste of PC Greens.” Whether you’re a vegan, vegetarian, or just looking for healthier options, we want to give you the opportunity to fulfill your desires. We are Pacific Coast Greens, and we make it our goal to provide the most high quality and locally sourced food in the area. We are ready to give our surrounding community the best taste of fresh, natural, and organic goods. Since 1993, we have loved our work in the gourmet and natural foods industry. We continuously strive to have a balanced and well rounded view of the way we consume food. We believe that what you put in your body essentially interacts with your entire self, mind, body, and soul. In honor of this 24 Year Anniversary…. 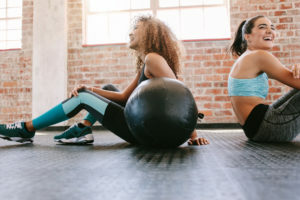 Here are 3 tips on how to live a more healthy lifestyle! 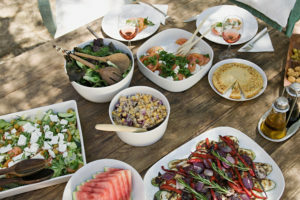 Without counting calories or stressing out about the time it takes to prepare a meal, eating healthy is as simple as purchasing the right things. Strict diets are not fun, and they are not necessary to consider yourself a “healthy eater.” That is why PC Greens focuses on natural ingredients. Fruits, vegetables, protein, and whole grains can direct your habits into the right direction. Eating healthy is a great first step to taking care of your body, but the results will be slow if an active life is not coupled with it. Any type of physical activity is a great way to stay fit and also practice healthy heart habits. Whether you’re walking, hiking, biking, or lifting weights, it is never a bad idea to just get out and move! The 21st century mindset is unbelievably scattered. Free time has suddenly become a taboo that no one talks about. We are taught to consistently be multitasking until our sleep habits are destroyed and our brain is exhausted. In the busy world that we live in, it is so easy to put work before self. but sometimes, the body just need REST. So sleep in, take a yoga class to clear your mind, and meditate on the beautiful world we live in. With all that said, we’d love to have you join us at this event Saturday, October 28th from 11am to 3pm. Samples in every department, but more importantly, a place to try a taste of PC Greens!